iOS 10 Features: Everything you need to know About #Infographic ~ Visualistan '+g+"
A worth upgrades for many new features in iOS 10. Much needed refresh is finally launched by Apple. 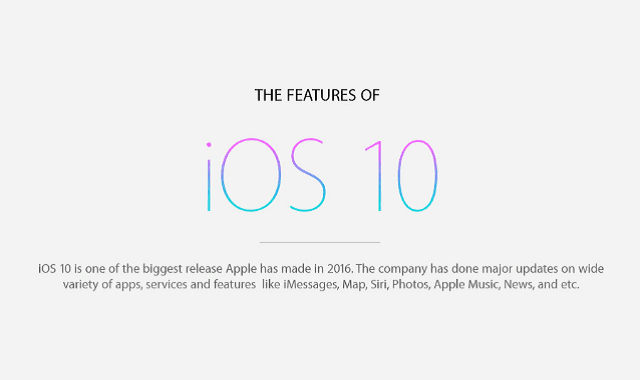 Apple CEO Tim Cook described iOS 10 as the "biggest release ever" for iOS users, but certainly it may not be the biggest deal for every iOS user and for some users it may be very fascinating as such features are redesigned and they look a lot nicer, much exiting and easy to use. The latest upgrade to iOS is packed with cool useful features that will refresh your iPhone or iPad. Are you the one who wants it right now? So if you're still not assured to about it, here's a look at some of the main features covered in below ‘quick look’ infographic and you might feel like you got a new iPhone or iPad. Just check it out in infographic. The size of this update package vary on the type of iOS device range from 600MB to 1.2GB. The new firmware offers many new features and improvements, including enhancements for the Widget, Home button, Messages, Maps, Photos, Siri, Home, and Music. So, after going through this infographic, it might be not hard to adopt to the latest IOS 10 version. Should you upgrade it? At this point I say yes, but only if your device will support it. You may google for how to use all of the new features in iOS 10 and how to install and backup procedure and they're useful to read through if you want to get more familiar with what iOS 10 is capable of. So go ahead, it is a free download for each user with an authorized device.